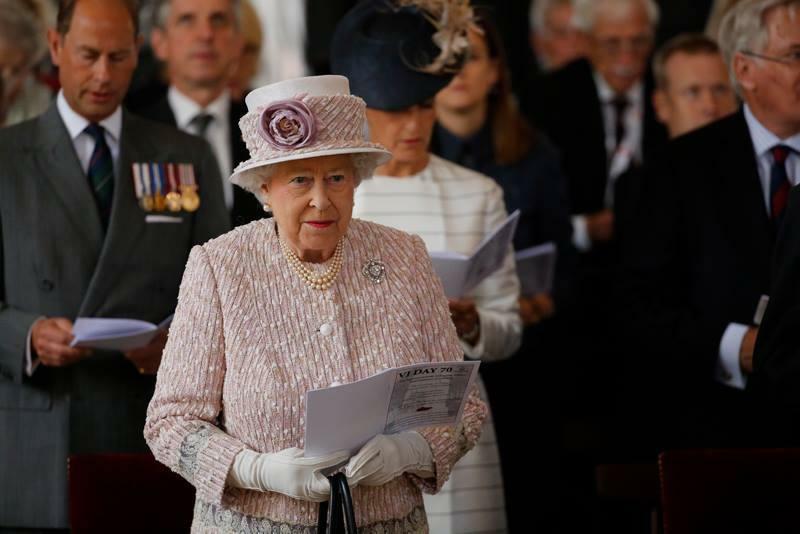 The Queen, accompanied by other members of the Royal Family, attended a Service of Remembrance at St. Martin-in-the-Fields, London, commemorating the 70th anniversary of Victory over Japan Day, which marks the surrender of Japan and the end of World War II. For more: Ministry of Defence Facebook, BBC News article and video, Zimbio gallery, Independent article. A rare trip back down to London during the Balmoral break for Her Majesty today, to attend another important World War II anniversary (despite alleged terror threats, I might add). She accessorized her repeated nubbly pink suit with the Cullinan V Brooch, which - coincidentally or not - we last saw at the commemorations of the VE Day 70th anniversary. Also present at the service were The Earl and Countess of Wessex and The Duke and Duchess of Gloucester. The Duchess and Countess both chose to repeat outfits today. Sophie's Emilia Wickstead is from Ascot and Birgitte's coat and hat are from about a million other occasions. Sophie did mix up her hat pairing, and though I think I prefer her original Ascot hat, I'm always a sucker for a French twist. The Prince of Wales and Duchess of Cornwall, meanwhile, were present for the commemorations at Horse Guards Parade and a reception for veterans at Westminster Abbey Garden. Camilla stuck with her usual jewel selections, including her Four Strand Pearl Choker with Small Diamond Clasp with her chain necklace and C charm underneath, and her Everyday Pearl Pendant Earrings. And since someone usually asks, I'll go ahead and tell you that in this picture, Charles has not been given a spirit stick by the local cheer squad - he's carrying his Field Marshal's Baton, which is part of his uniform.